At twenty-three, Saba Tarcan knows her only hope of escaping the clamor of Cardiff Bay, Wales, lies in her voice. While traveling Britain, singing for wounded soldiers, Saba meets handsome fighter pilot Dom Benson, recovering from burns after a crash. When Saba auditions to entertain troops in far-off lands, Dom follows her to London. Just as their relationship begins to take root, Saba is sent to sing in Africa, and Dom is assigned a new mission in the Middle East. As Saba explores Cairo’s bazaars, finding friendship among the troupe’s acrobats and dancers, Dom returns to the cockpit once again, both thrilled and terrified to be flying above the desert floor. In spite of great danger, the two resolve to reunite. When Saba learns that her position makes her uniquely qualified for a secret mission of international importance, she agrees to help the British Secret Service, concealing her role from Dom. Her decision will jeopardize not only her safety but also the love of her life. I really wanted to like Jasmine Nights. One of the main characters, Saba, is quite endearing at the beginning of the story but not long after it begins, this story starts to drag. And it also has a lot of scenes that I find would be quite unbelievable or at least quite fantastical. For example, a woman running around unescorted in Cairo, Egypt in the 1940s? I don't think that is something that probably easily happened back then, and when she stays over with her lover? Equally as unbelievable. The story seemed quite over the place and didn't segue from one place to the next easily or in a way that was always evident even. Sometimes it was confusing to follow what was going on where at the beginning of a new chapter. The book felt like a long bad episode of someone's longings that really didn't give me anything that I wanted to share or rave about. I love reading a good story and then telling others about it. I dreaded having to pick this book up every day and felt like it was basically a chore that I had to slog through to the bitter end in order to get this done. That, to me, is not a good story. 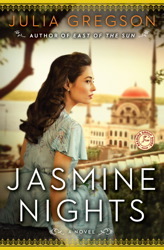 Not a story that flows or inspires so unfortunately I wouldn't really recommend Jasmine Nights unless you are a great historical fiction fan and even then, I warn you that it lacks in details and imagination.